Do you think it’s kitschy to use synthetic, or fake grass, to style your home? While some might dismiss artificial greenery as tacky and tasteless, synthetic grass is sprouting up in interiors. And if you’d like to know how to use synthetic grass without ending up with an indoor soccer field, read on to learn some interior décor tips. One of the pleasures of summer time is kicking off your shoes and going barefoot in the grass. The soft, cool texture of grass is Mother Earth’s best carpet. And you can enjoy that summery joy in the form of synthetic grass now. So, regardless of the season, you can meander on grassy carpets year round. Because minimalism is a common theme in many interiors today, most homes are filled with whites, greys, ivories, creams and taupe. Synthetic grass adds a much-needed pop of color to an otherwise neutral interior, creating contrast and giving your home a unique touch. If you’re worried that a full floor of synthetic grass would be too much, you’ve got plenty of other options. You can always place statement rugs underneath consoles, chairs or tables. And since green grass has always accompanied brown tree trunks and branches, it’s a match made in heaven with your earth-toned furniture pieces. Or better yet, why not try glass table? Want to make a big statement? Carpeting your stairways with synthetic grass adds both a comfortable surface for your feet and a striking focal point for everyone who sees it. If you have designated rooms or areas in your home for toys and games, you can spruce it up with synthetic grass, too. Your children will love their new space, and you can rest assured knowing your children are playing to their heart’s content in the safety and security of your home. Now, a grass couch might be a bit of a stretch, but a grass covered chair seat or stool can be a fun way to accessorize your bedroom, entry way, kitchen or living room. Shops, hotels and restaurants are already using synthetic grass to wow their clients and give their customers something new and fun to experience. But you don’t have to leave your home in order to experience something special and exotic. Some people might discourage synthetic grass and advise that you just use real plants to create something unique. But if you’re not much of a green thumb, and you tend to (unintentionally) kill all of your house plants, it can be a challenge to have anything green in your home. That’s why adding synthetic grass to your walls can create a cool texture and give you your very own garden of Babylon. People spend most days running from one building to another, via cars or public transport. They interact with more and more technology, and barely have any opportunities to commune with nature or get outside. What’s more, all of this hustle and bustle leads to elevated stress levels and anxiety. The color green is associated with peace, tranquility, serenity and calmness. By adding green to your home, you encourage your mind to slow down, and your body to relax. And we all need to do that more often! So, if you arrange your home interiors in a way that promotes these things, you’re doing yourself a big favor! 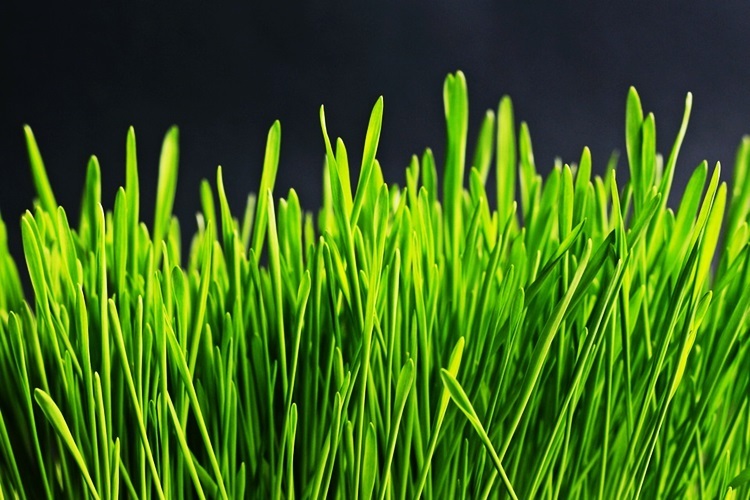 The idea of synthetic grass may be off-putting if you imagine having a carpet, or wall hanging that looks like a neglected and overgrown lawn. But you’ll find that there are many different varieties of synthetic grass, and they check all the boxes, from length, to color, to thickness. You can easily find a style of grass that perfectly suits not only the living space, but how you use that space, too. You might prefer soft and short grasses for children’s play areas, and you might like a thick throw along your bedside. In short, just as there are many different blades of grass, the world of synthetic grass has lots of options, too. You might be hesitant to incorporate more plastics into your living space. However, there are many benefits to using synthetic grasses in your home. Let’s have a look at what some of them are. Synthetic grass may seem to cost more up front, but it is very durable and long-lasting, making it a good investment for your home in the long run. Because it’s not absorbent, like most carpets and furniture pieces, it dries much more quickly. And if you’re afraid of vacuuming it. Don’t be! You can safely clean it with a vacuum just as you would a carpet. You and your children may suffer from seasonal or plant allergies. This makes synthetic grass a nice alternative, where you can enjoy the feeling of an outdoor yard, without any of the health complications. We all do our best to remove any known health threats from our home. By using synthetic grass, you decorate with a non-toxic material that gives your safe haven a cozy feel without compromising your standards or values. Plus, synthetic grasses are usually made sustainably, and that’s always something to feel good about it! While synthetic grass can melt if it’s exposed to very high temperatures, they are non-flammable and you can easily find fire-proof synthetic grasses in today’s market. Luckily, people have developed the technology necessary to recycle synthetic grasses. This ensures that the different materials within synthetic grass are separated and recycled properly. So, when it comes time to replace your synthetic grass, you can feel good knowing it won’t end up in a landfill. While synthetic grasses may not be for everyone, lots of people are now enjoying this new, green décor option. If you’re curious, why not start small, and have fun with some indoor greenery? Next articleHow Can an Extroverted Woman Win the Heart of an Introverted Man?